SHELLEY FINE BONE CHINA ENGLAND OLEANDER LAVENDER CUP (4 3/4" DIAMETER FROM HANDLE TO OPPOSITE EDGE OF CUP) & SAUCER (5 3/4" DIAMETER) SET (3 AVAILABLE). 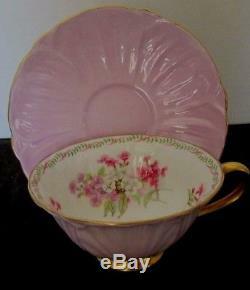 CONDITION NO CHIPS, CRACKS, DESIGN LOSS OR FADING; BEAUTIFUL BEAUTIFUL PINK & PURPLE FLORAL WITH LAVENDER LEAF BACKGROUND. NO GOLD LOSS OR WEAR. 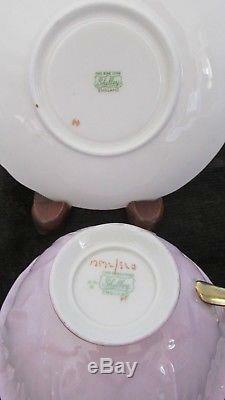 MARKS GREEN SHELLEY FINE BONE CHINA ENGLAND. 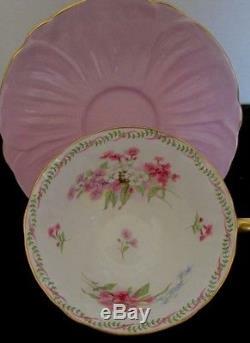 The item "SHELLEY FINE BONE CHINA ENGLAND OLEANDER LAVENDER CUP & SAUCER SET" is in sale since Thursday, October 18, 2018. This item is in the category "Pottery & Glass\Pottery & China\China & Dinnerware\Shelley". The seller is "brknspk" and is located in West Brookfield, Massachusetts.